Feral apple trees abound in Isle Madame - dotted through the woods, standing gnarled in deserted fields, adorning the edges of roads. They include several different varieties - probably heritage strains, since they apparently descend from orchards planted by French settlers in the 18th century. In October, they should be groaning with apples. But this one, growing beside a long-abandoned road, bore not a single fruit. Later that day, I drove the five miles from the bridge at Lennox Passage to my house in D’Escousse. Apple trees grow along that road as closely as schoolchildren waiting to cheer a parade - so many, in fact, that I would like to see the dull name “Route 320″ replaced by Route des Pommiers/Apple Tree Road. But I saw no pommes on Route des Pommiers either. By now I was curious, and rather alarmed. What about my own fruit trees, the ones that grow around my boat shed, and carpet the ground with little sour apples at this time of year? Local deer-hunters generally phone me in the fall to ask if they can have the apples to set out as deer-bait. But nobody had called this year. No wonder. Five trees, and between them they had barely produced enough apples to make a pie. My buddy Edwin DeWolf, who built the shed, drove up beside me. “No apples this year,” I said. That evening I saw Farley and Claire Mowat, who last month donated 200 stunning seaside acres to the Nova Scotia Nature Trust. This splendid gift includes 35 years’ worth of the Mowats’ careful records and observations on the site and in the area. Was it truly just a cold, late spring - or something more alarming? Bees, I remembered, have been dying off in record numbers right across the United States and Europe, and nobody knew why. Honeybees are not native to North America, and indigeous North American plants didn’t need them for pollination - but the species that do need them are the ones in the supermarket, the products of industrial agriculture: apples, almonds, cherries, tomatoes, zucchinis, cantaloupes. Theories about the cause of their decline ranged from new pesticides, mites and genetically modified crops to climate change, fungi and even radiation from cell phones. Whatever the reason, the U.S. problem was serious. Every third bite we eat, says one expert, “is dependent on a honeybee.” In the U.S., the crops pollinated by honeybees are valued at something like $15 billion. The California almond crop alone is worth $1.5 billion. With money like that at stake, agribusiness doesn’t leave pollination to nature. Bees have been bred to work both earlier and later in the season - and they migrate to where they’re needed. Huge semi-trailers packed with hundreds of millions of bees rumble through U.S. agricultural districts, renting the bees’ services to farmers. These bees make money, not honey. (Believe it or not, American honey is being undercut by cheaper honey from China.) Industrial bees don’t eat nectar, either. Their food arrives in tanker trucks full of protein supplements, sucrose and corn syrup. It costs $12,000 per load. “I don’t think the situation in the States is related,” said Farley. “We had extreme conditions this year, including the most rain we’ve seen in 35 years, nearly 40 inches. We also had a lot of fog, and flying insects can’t handle fog.” A biologist from the Nova Scotia Museum later confirmed a “patchy” die-off of bees in some districts of the province. And what about the swallows? The apples of Isle Madame have survived 250 years so far, so I guess they’ll be back. But it’s a very strange autumn without them. Silver Donald Cameron’s award-winning book The Living Beach is available at http://www.capebretonbooks.com/. The speed at which mankind is using and abusing the Earth’s resources is putting humanity’s survival at risk, scientists have said. The bleak assessment of the state of the environment globally was issued as an “urgent call for action” amid growing concerns of worldwide waste, neglect and governmental inertia. Fundamental changes in political policy and individual lifestyles were demanded by the United Nations Environment Programme (UNEP) as it gave warning that the “point of no return” for the environment is fast being approached. The damage being done was regarded by the UN programme as so serious that it said the time had come for the environment to be a central theme of policy-making instead of just a fringe issue, even though it would damage the vested interests of powerful industries. Marion Cheatle, of the environment programme, said that damage sustained by the environment was of fundamental economic concern and, if left unchecked, would affect growth. “The report provides incontrovertible evidence of unprecedented environmental change over the last 20 years that, unless checked, will fundamentally undermine economic development for current and future generations,” she said as the report was released in London. The report, the fourth Global Environment Outlook: environment for development (GEO-4), assessed the impact on the environment since 1987. It was drafted on the basis of reports by almost 400 scientists, all experts in their fields, whose findings were subjected to review by another 1,000 scientists. Climate change was identified as one of the most pressing problems but the condition of freshwater supplies, agricultural land and biodiversity were considered to be of equal concern. It came 20 years after the publication Our Common Future by the Brundtland Commission, the first attempt by the UN to provide a comprehensive review of Man’s impact on the environment. They said the scale of the challenge was huge and highlighted a series of problems that need to be faced and tackled by people and governments around the world before damage to the environment becomes irreversible. Increases in the world population, which has risen almost 34 per cent from 5 billion in 1987 to 6.7 billion today, have caused many of the challenges because of the demands on the Earth’s natural resources. Demand, heightened by a three-fold increase in trade since 1987, means that more is now being produced than can be sustained in the long term. On average, each person needs 21.9 hectares of the Earth’s surface to supply their needs whereas, it was calculated, the Earth’s biological capacity is 15.7 hectares per person. The report was critical of the lack of action by governments in protecting the environment. The response to climate change was described as “woefully inadequate” but it was regarded as one of several significant problems that need to be addressed effectively. “We appear to be living in an era in which the severity of environmental problems is increasing faster than our policy responses,” it said. “To avoid the threat of catastrophic consequences in the future, we need new policy approaches to change the direction and magnitude of drivers of environmental change. Overfishing was singled out as an issue that needed to be tackled as a priority. Measures to protect biodiversity, with species being forced into extinction at a rate 100 times faster than any in fossil records, were regarded as equally urgent. Achim Steiner, executive director of UNEP, said that the international community’s response to environmental issues was at times “courageous and inspiring”, but all too often was inadequate. “The systematic destruction of the Earth’s natural and nature-based resources has reached a point where the economic viability of economies is being challenged - and where the bill we hand to our children may prove impossible to pay,” he said. Mike Childs, of the environmental campaign group Friends of the Earth, said: “The steady degradation of the world’s environment threatens the well-being of everybody on the planet. By SANDY MILLER HAYS, Agricultural Research ServiceTalk about a "vegetable for all seasons" — that's the potato.In the spring and summer, what picnic would be complete without potato salad? In the cooler months, nothing can beat a hearty potato soup. And just imagine how lonely that sizzling steak would be on your plate without its buddy, the baked potato.That's probably why the spud is Americans' favorite veggie; U.S. consumers eat about 130 pounds of potatoes per person every year. Now here's even more reason to love potatoes: They're loaded with good-for-you plant compounds called phytochemicals. Although phytochemicals aren't considered essential vitamins or nutrients, they're thought to promote human health in a variety of wonderful ways, such as neutralizing cancer-causing agents and cell-damaging molecules called free radicals.In the past, folks have tended to associate phytochemicals with brightly colored fruits and veggies, or the dark green vegetables like broccoli or brussels sprouts. What tends to come to mind with potatoes is starch and carbs.But the scientists of the Agricultural Research Service (ARS) say we need to adjust how we think about potatoes, because they're packed with substances called phenolic compounds that have all sorts of health-promoting capabilities, including antioxidant activity.The ARS scientists aren't just speculating about spuds. They've come up with new analytical methods that help them detect phytochemicals and their concentrations in the potatoes' skins and flesh.They've put these methods to work on some 100 wild and commercially grown potatoes, and have uncovered up to 60 different phytochemicals and vitamins. The lineup includes vitamin C, folic acid, chlorogenic acid, flavonoids, and one that's new to me and perhaps to you: kukoamines, which might be able to help lower blood pressure.Prior to a 2005 report by the Institute of Food Research, kukoamines had only been found in a Chinese medicinal plant called Lycium chinense. But the ARS research team in Washington State has used their new analytical methods to find more than five different kinds of kukoamines in potatoes grown right there in the Pacific Northwest.One question that remains unanswered at this point is whether we consumers could get enough of a phytochemical like kukoamine from eating normal-size servings of potatoes that contain it. Although plant breeding efforts in the past have tended to focus on making a crop more productive or more resistant to pests, new interest might be focused on breeding specifically to elevate the crop's nutrient content, once scientists have pinpointed the roles of the various healthful compounds.For example, one promising group of compounds is called flavonoids. These natural substances could help diminish the risk of cardiovascular and other diseases, respiratory problems such as asthma, and even certain cancers, such as prostate and lung cancer.There are other flavonoids, such as the anthocyanins in blueberries, that help wipe out free radicals before they can harm your body's cells and tissues. So far, the ARS researchers have shown that there can be as much as a 30-fold difference in the flavonoid concentrations in potato specimens—so there's lots of room to maneuver in a potato breeding program!Another appealing flavonoid is quercetin, which is abundant in red onions. Today the quercetin levels in potatoes are generally lower than those in the onions, but on the plus side, the average American eats more potatoes than red onions. It's possible that as the scientists keep probing the phytochemical content of potatoes, they'll find a potato with an unusually high content of quercetin—or something equally useful.There's certainly lots of room for exploration in the world of potato profiling. Take, for example, folic acid, which is very important in the diets of expectant mothers because of its role in proper fetal development. The ARS scientists looked at 70 types of potatoes and found a nearly three-fold difference between the high-folic-acid types and those with less of this important substance. Before they started their analysis, only six varieties of potato had ever been examined for folic acid content.Eventually, the scientists will turn their profiling results over to potato breeders—and someday in the not-too-distant future, we lucky consumers may all be enjoying Super-Spud! of the Earth’s plants and animals, acts as a wake up call on the global extinction crisis. Vitamin A deficiency is widespread and has severe consequences for young children in the developing world. Food-based approaches may be an appropriate and sustainable complement to supplementation programs. Orange-fleshed sweet potato (OFSP) is rich in b-carotene and is well accepted by young children. In an extremely resource poor area in Mozambique, the effectiveness of introduction of OFSP was assessed in an integrated agriculture and nutrition intervention, which aimed to increase vitamin A intake and serum retinol concentrations in young children. The 2-y quasiexperimental intervention study followed households and children (n ¼ 741; mean age 13 mo at baseline) through 2 agricultural cycles. In y 2, 90% of intervention households produced OFSP, and mean OFSP plot size in intervention areas increased from 33 to 359 m2. Intervention children (n ¼ 498) were more likely than control children (n ¼ 243) to eat OFSP 3 or more d in the last wk (55% vs. 8%, P , 0.001) and their vitamin A intakes were much higher than those of control children (median 426 vs. 56 mg retinol activity equivalent, P , 0.001). Controlling for infection/inflammation and other confounders, mean serum retinol increased by 0.100 mmol/L (SEM 0.024; P , 0.001) in intervention children and did not increase significantly in control subjects. Integrated promotion of OFSP can complement other approaches and contribute to increases in vitamin A intake and serum retinol concentrations in young children in rural Mozambique and similar areas in Sub-Saharan Africa. J. Nutr. 137: 1320–1327, 2007. 24 OCTOBER 2007 ALOTAU (Pacnews) – The discovery of 24 new species of plants and frogs in the highlands of Papua New Guinea has forced scientists to call for the protection of the biodiversity of the remote Kaijende Highlands. Of the 24 species – 16 are new plant and the rest were new types of frogs. They were discovered by a group of scientists from Conservation International in 2005. “A management plan needs to be developed to reduce threats posed by climate change, increasing fire frequency and hunting, said Conservation International. The findings were revealed in a report tabled at the 8th Pacific Islands Conference on Nature Conservation and Protected Areas, underway in the small town of Alotau in PNG’s Milne Bay Province. In 2005, an expedition consisting of scientists and representatives from PNG’s department of environment went to the highlands to assess conservation needs when they stumbled onto these new species. “The vast near uninhabited Kaijende highlands boasts some of PNG’s most pristine and scenic habitat, but little is known about it despite mining in the area, said Dr Steve Richards of the South Australian Museum, who led the expedition. In total, the group documented 643 species, including the new plants and frog species. “One of the frogs probably represents a new genus,” a statement from Conservation International said. Also, a spectacular bird of paradise known as the Ribbon-tailed Astrapia, which has the longest tail feathers in relation to body size of any bird, was found to be in abundance than other areas of PNG. Regional theologians and church workers are now taking a serious step towards conservation work. More than 40 representatives from theological schools- faith based organizations and Fiji based conservation organizations are meeting at the Jovili Meo Training Center in a week-long seminar. Tourism and Environment Minister Bernadette Rounds Ganilau who opened the week-long consultation stressed the importance of conservation in the region. “The trees we cut have taken away our natural provider of oxygen, its roots now gone cause landslides and devastation. “The once natural water flow is dried up and our natural food chain disappears, taking us away from our own natural habitat and our food security. “The air we breathe contains toxins that make our vulnerable children and elderly more mere statistics in the high incidence of respiratory disorders in the region,” said Ganilau. She said the emphasis of conservation coming from theologians and church workers carries weight and that conserving and protecting the environment is also a “God Given Mandate” of church workers. The fifth meeting of the Ad hoc Open-ended Intersessional Working Group on Article 8(j) (traditional knowledge) and related provisions (Article 8(j) WG) of the Convention on Biological Diversity (CBD) opened in Montreal, Canada, on Monday 15 October 2007. In plenary in the morning and afternoon, delegates: observed a Mohawk opening ceremony; heard general statements and a report on the outcomes of the fifth meeting of the Working Group on Access and Benefit-sharing (ABS WG); considered recommendations of the UN Permanent Forum on Indigenous Issues (UNPFII); and debated progress on the Article 8(j) work programme. Delegates then broke into two sub-working groups (SWG). SWG I addressed the composite report on traditional knowledge (TK), and SWG II considered mechanisms for indigenous participation. Fernando Coimbra (Brazil), on behalf of COP President Marina da Silva, opened the meeting, calling on delegates to continue their work, especially on an ethical code of conduct for the respect and protection of indigenous cultural and intellectual property. He also invited the Article 8(j) WG’s contributions to the ABS WG. A representative of the Mohawk Nation welcomed delegates to Mohawk territory and prayed for positive meeting outcomes. Invoking the peaceful and cooperative spirit of the Haudenosaunee Confederacy, Ahmed Djoghlaf, CBD Executive Secretary, underscored the importance of cooperation to meet the challenges of biodiversity loss and climate change. SWG II. MEXICO requested clarification on whether nominating indigenous representatives who are not members of party delegations as Co-Chairs was in accordance with the CBD’s rules of procedure. Ahmed Djoghlaf explained that appointing indigenous Co-Chairs constitutes a generally accepted informal custom at meetings of the Article 8(j) WG. GENERAL STATEMENTS: The PHILIPPINES and Malawi, for the AFRICAN GROUP, underscored linkages between the work of the ABS and Article 8(j) WGs. Portugal, for the EU, and the GLOBAL FOREST COALITION, requested that the Article 8(j) WG address impacts of biomass production and consumption on indigenous peoples. CANADA said the WG should prioritize issues that relate to the CBD’s objectives. COLOMBIA outlined national progress in the recognition of indigenous rights and the establishment of mechanisms for indigenous participation. Yemen, for the ASIA AND PACIFIC REGION, stressed the need for fair and equitable benefit-sharing with indigenous and local communities, while NIGERIA and SOUTH AFRICA stressed the importance of the future ABS regime. Several indigenous representatives requested the full and effective participation of indigenous youth and women, especially regarding ABS. The INTERNATIONAL INDIGENOUS FORUM ON BIODIVERSITY (IIFB) said any international ABS regime must be informed by the UN Declaration on the Rights of Indigenous Peoples (UNDRIP) and underlined the need for a strong ethical code of conduct for the respect and protection of indigenous cultural and intellectual property. CANADA noted that the UNDRIP is not legally binding but reiterated commitment to Article 8(j) implementation. AUSTRALIA outlined reasons why it cannot support UNDRIP. The INDIGENOUS WOMEN’S BIODIVERSITY NETWORK affirmed that indigenous knowledge is not in the public domain but rather regulated by indigenous legal systems. The INTERNATIONAL FORUM OF LOCAL COMMUNITIES supported the development of sui generis systems for the protection of TK. AUSTRALIA urged that the Article 8(j) WG focus on fewer activities to maximize implementation. COSTA RICA requested national implementation of UNDRIP. The WORLD INTELLECTUAL PROPERTY ORGANIZATION noted its activities under its Memorandum of Understanding with the CBD and described its voluntary fund for indigenous participation. ABS WG Co-Chair Tim Hodges (Canada) reported on the outcomes of ABS 5 held from 8 to 12 October 2007, noting that the meeting laid the groundwork for further progress at ABS 6. Recommendations of the UNPFII: Chair Coimbra introduced recommendations of the UNPFII (UNEP/CBD/WG8J/5/9). INDIA mentioned the importance of the UNDRIP, and MEXICO underscored the need to secure financing for implementation of the recommendations. NEW ZEALAND and AUSTRALIA suggested addressing a recommendation on capacity building to enable indigenous participation in the development of an international ABS regime. The PHILIPPINES noted the importance of capacity building for indigenous youth. CANADA supported convening regional and sub-regional ABS workshops and developing a limited number of indicators to evaluate progress towards the CBD’s 2010 target. The EU proposed a new paragraph relating to cooperation between the CBD and the UNPFII, with ARGENTINA asking for clear terms of reference in this regard. NA KOA IKAIKA O KA LAHUI HAWAI’I called for the identification of best practices of indigenous peoples’ management of territories and resources, with a view to merging the approaches with modern techniques. A revised draft recommendation will be prepared. Progress on the Article 8(j) work programme: Chair Coimbra invited comments on progress reports regarding the Article 8(j) work programme (UNEP/CBD/WG8J/5/2/ and Add.1). AUSTRALIA called for further discussions on the remaining tasks of the work programme. NEW ZEALAND suggested focusing future work of the Article 8(j) WG on the 2010 target and developing an ABS regime by 2010. INDIA proposed focusing on ABS and TK protection. COLOMBIA pointed to the linkage between the development of sui generis systems for the protection of TK and ABS. BRAZIL highlighted public consultations on national ABS legislation which contains procedures for benefit-sharing with indigenous peoples. The EU, COLOMBIA, NEW ZEALAND and ARGENTINA supported focusing on: task 7 (guidelines to ensure equitable benefit-sharing with TK holders); task 10 (prevention of unlawful appropriation of TK); and task 12 (guidelines to implement Article 8(j)) by continuing work on sui generis systems noting that any further work would require further discussions. The PHILIPPINES asked that guidelines be consistent with UNDRIP and called for action on all outstanding tasks by 2010 and a timeframe for their completion. MEXICO urged parties to submit progress reports on Article 8(j). The IIFB expressed concern that some parties do not recognize the existence of indigenous peoples in their countries. TANZANIA and MALAWI welcomed the appointment of a focal point for indigenous peoples within the Clearing-House Mechanism. A revised draft recommendation will be prepared. COMPOSITE REPORT: SWG I Co-Chair Deon Alexander Stewart (Bahamas) introduced relevant documents on phase II of the composite report on the status and trends regarding the knowledge, innovations and practices of indigenous and local communities relevant to the conservation and sustainable use of biodiversity (UNEP/CBD/WG8J/5/3, Add.1, Add.2, INF/3, 4, 5, 6, 7 and 8). Delegates discussed obstacles for TK protection and considered guidelines for documenting and recording TK and the potential threat of such documentation. Uganda for the AFRICAN GROUP asked for capacity building to enhance understanding of the effects of climate change. INDIA, BRAZIL, NEW ZEALAND, ARGENTINA and AUSTRALIA suggested restricting climate change considerations to its effects on biodiversity. BRAZIL called for a reference to indigenous communities in riparian zones. The IIFB suggested the Secretariat initiate an expert working group on the impacts of climate change on TK. CANADA urged that issues relating to the Arctic be considered by the Arctic Council. CANADA and NORWAY, opposed by INDIA and BRAZIL, requested deletion of a reference to health protocols and food security plans for indigenous and local communities living in voluntary isolation. The IIFB underscored the cultural right to live in isolation. MECHANISMS FOR PARTICIPATION: SWG II Co-Chairs Breier and Retter invited comments on mechanisms for full and effective indigenous participation (UNEP/CBD/WG8J/5/5 and INF/14). Noting limited access to web-based communication technologies, MEXICO, BRAZIL and COLOMBIA called for work on other means of communication, and for timely translation of documentation into UN languages to facilitate translation into indigenous languages. NEW ZEALAND and NORWAY, opposed by the IIFB, cautioned against recommending increasing the budget for translation, with NEW ZEALAND and CANADA preferring preparation of a list of financial implications for COP consideration. The EU suggested monitoring the use of communication means by indigenous communities to identify effective communication strategies. The TEBTEBBA FOUNDATION proposed indicators to measure indigenous participation in national and international CBD-related processes. BRAZIL and the AFRICAN GROUP suggested encouraging indigenous and local communities to develop their own communication tools. SENEGAL and HAITI favored holding TK workshops in communities. THAILAND called for integrating communication tools in national biodiversity strategies and action plans. NORWAY encouraged the inclusion of indigenous representatives in country delegations. GUINEA BISSAU emphasized participatory resource management strategies. Many indigenous representatives called for increased funding for indigenous participation and their recognition as key players in TK protection. ARGENTINA asked that the voluntary fund for indigenous participation prioritize indigenous participants from developing countries. The AFRICAN GROUP called for support for indigenous youth participation, with the INDIGENOUS YOUTH CAUCUS suggesting funding two indigenous youth representatives per region. INDIA called for toolkits of measures and mechanisms to address the underlying causes for the decline of TK, innovations and practices to address all possible safeguards. BRAZIL requested that the development of TK databases should be based on indigenous PIC. The IIFB noted the need for a timeline and the prioritization of tasks to address the underlying causes of the decline of TK. Noting diverse ways of holding TK in various parts of the world, CANADA suggested focusing on community-based initiatives. Following last week’s ABS WG meeting, delegates expressed eagerness to enter into substantive negotiations on TK. Some delegates noted that since progress at the ABS WG on defining a framework for future negotiations had been slow, the Article 8(j) WG could seize the opportunity of making real strides in the development of sui generis systems for the protection of TK and of a draft code of ethics, and thereby provide a kick-start to the next meeting of the ABS WG. Another delegate warned that if little progress is made here, and if ABS negotiations pick up momentum in Geneva, the Article 8(j) agenda might be left behind. Food labels were designed to earn our trust. Since 1990, the Food and Drug Administration has required manufacturers to list the ingredients of their products, and more recently, “Nutrition Facts” boxes appear on everything from cereal to chewing gum. But as more Americans attempt to make healthy choices about what they put in their bodies, it’s becoming increasingly more difficult to discern how our food was grown, processed and treated-thanks to our collective support of a food industry that wields its heft and political clout to create labeling laws that make a mockery of disclosure. This is a story about a regulatory system increasingly friendly to the notion that consumers aren’t smart enough or sufficiently informed to make the “right” choices-an idea the food industry uses to justify the argument that obfuscating the information on food labels serves some undefined public good. It’s also about what happens to our food when industry attempts to achieve economies of scale to meet our expectations that a bag of organic lettuce mix should cost the same as a Yoo-hoo and carry almost as long a shelf life-not to mention our willingness to believe that everything edible constitutes food. It’s also a story about nomenclature. At some undetectable moment in recent history, modern food parlance parted ways with common standards of forthrightness and left us in an up-is-down world where food manufacturers may soon be able to subject food to ionizing radiation and call it “cold pasteurization,” where “chocolate” may not have to actually contain cocoa and almonds labeled “raw” must be sprayed with a suspected human carcinogen. In this world, makers of an artificial bovine hormone to increase milk production have used their leverage with regulators to bully dairies that don’t use the hormone into cowering away from disclosing on their labels why consumers might want to avoid it. In this world, it is easier and more cost effective to unleash a mix of genetically modified viruses on lunchmeat for children’s sandwiches rather than clean up filthy slaughterhouses. In this world, it is increasingly challenging for consumers desiring to make healthier choices to know which way to turn. The move follows two Salmonella outbreaks attributed to raw almonds in 2001 and 2004. Critics of the rule point out that both incidents were the result of faulty practices at large-scale commercial farms. Small-scale and sustainable practices-including mowing and mulching to control weeds, instead of using chemical herbicides-naturally prevent the spread of harmful bacteria more effectively than post-harvest treatment, they say. The Almond Board of California, a governing body representing all almond growers in the state, pushed for the change. Small growers complain that the board disproportionally represents the needs of the large producers. A spokesman for the USDA’s Agricultural Marketing Service says that the agency simply responded to the almond board’s request. “We basically move at the behest of industry,” spokesman Jimmie Turner says. “If the industry calls and says they want a standard or a marketing order, we take that request, and normally we do what’s called a notice in the Federal Register. We seek public comment, and based on that comment, there can be a marketing order established.” The same process is followed for all food stuffs, Turner says. The Cornucopia Institute, a Wisconsin-based farm policy research group leading a campaign to convince the USDA to overturn the pasteurization rule, contends that labeling treated almonds as “raw” is deceptive. More than that, the group argues that it epitomizes the industrialization of our food supply. “This is just the opening salvo of corporate agribusiness wanting to sanitize all of our food,” says Mark Kastel, co-founder of the Cornucopia Institute. The impetus, Kastel says, is the economics of large-scale production. In many cases, such operations utilize growing and cultivation methods that provide much greater opportunity for contamination. To comply with the regulation, almond producers can either steam the nuts or fumigate them with propylene oxide (PPO), the almond board’s preferred process. PPO is recognized as a possible human carcinogen by the International Agency for Research on Cancer. It is banned in the European Union, Canada, Mexico-and much of the rest of the world. Examples of the regulated controlling the regulators-like almond producers writing their own rules-are rampant up and down the American food chain. The 2006 controversy parallels a fight in 2003 when Congress inserted a provision into a spending bill that would have allowed meat and poultry producers to label their products “organic” even if the animals were fed conventional feed-if the price of organic feed exceeded a certain level. The exception was later repealed. Cummins hopes to bring the same fate upon the synthetics loophole or at least significantly curtail its reach. Under 1994 guidance from the FDA-which approved the use of rBGH and maintains that it’s completely safe-most dairy processors that market milk from cows not treated with the hormone include a disclaimer on the label indicating that “no significant difference has been shown between milk derived from rBST-treated and non-rBST-treated cows.” Monsanto asked the agency to revisit the issue, as the company deems that this disclaimer is not enough to “balance” what it asserts are deceptive claims by producers that milk from cows not treated with the hormones is healthier. In response, the FDA reaffirmed its commitment to the current guidance for labeling rBGH milk. The FTC requested that several companies amend the way they label milk from cows free of the artificial hormone. The companies complied., according to Monsanto. “Veterinarians can sell a drug to a farmer that is not approved for that use,” Cummins says. “Europeans are appalled that U.S. dairy farmers have access to 50 to 100 antibiotics, whereas [the FDA] only tests for four.”Chocolate by any other name? Delegates to the fifth meeting of the Ad Hoc Open-ended Working Group on Access and Benefit-sharing (ABS) of the Convention on Biological Diversity (CBD) met all day in plenary and addressed elements of an international regime on ABS relating to fair and equitable benefit-sharing, access to genetic resources (GR), compliance with prior informed consent (PIC) and mutually agreed terms (MAT), and an internationally recognized certificate of rigin/source/legal provenance. for developing sectoral approaches to MAT between users and providers. Calling for full participation in the regime’s negotiations, the LATIN AMERICAN, PACIFIC and AFRICAN INDIGENOUS CAUCUSES stressed the link between GR and traditional knowledge (TK). The PACIFIC and AFRICAN INDIGENOUS CAUCUSES also called for: benefit-sharing regarding GR and TK accessed at ex-situ collections; conformity with customary laws and practices; and inclusion of non-monetary benefits, such as access to medicines derived from GR and TK. AUSTRALIA cautioned against prescribing a mandatory list of benefits since it would be unworkable and undermine national sovereignty. I have become a vitamin A convert! I know you will be aghast as such a revelation, but it is true. A few days ago I spent 10 days in the Kwaio bush on Malaita, visiting some of the most isolated villages in Solomons, certainly the most impoverished. In some villages it was 12 hours walk to a school or clinic. Many were of traditional belief, so no support services such as those that churches might give Christian communities. General health was awful.We were fortunate to have Chris Chevalier with us, who is not only a community health specialist but also a trained nurse. His survey of child health records and interviews with mothers and aid post staff were very instructive; the conclusions left no doubt that malnutrition in children was an important problem in bush villages.Through my ignorance, I did not realise the importance of vitamin A in children, especially during the weaning period; I thought it was all about eye sight andother things in adults. I am a little wiser now and realise, not only the importance of greens because of their high vitamin A content, but also thepotential of orange fleshed sweet potato for kids. So how come I missed this: amI the only one in the world short of this information. If not, have scientists lost the art of communication? This is what Chris said in our report: In particular, there is a need to make mothers aware of the importance of foods high in vitamin A. Vitamin A has a very important role in child health andsurvival. It increases resistance to infection, particularly ARI, diarrhoea, and blindness by protecting the linings of the respiratory and digestive systems aswell as preventing eye diseases. 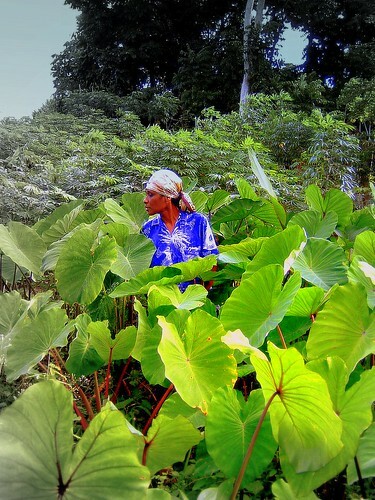 In 1991, a vitamin A deficiency survey showed Malaita as one of the areas of highest risk. The food recall carried out during this assessment showed that children are receiving vitamin A primarily from pawpaw. This is insufficient. Other foods which are very high in vitamin A that could be used in the bush include leaves of cassava, sweet potato, pumpkin and sliperi kabis, roots of carrot and fruits of pumpkin. Fern and wild mango would also provide vitamin A levels similar to those of pawpaw. Orange fleshed sweet potatoes also have a role to play. More awareness of the benefits of these foods is required. So, OFSP: bring them on! Pacific Magazine reports many fruit bearing trees are affected and in particular coconut, the main economic and social backbone of people living on the outer islands. Officer in charge of copra trading within the country, Awaki Baare, from the Ministry of Commerce, Trade and Cooperative says the trading has dropped tremendously from the southern islands. "We used to send money twice in a month for purchasing, but now its only happens once," he said. "Copra trading with the Central Kiribati and the Linnix (Line and Phoenix Islands) is still strong and ongoing. But Northern Kiribati is gradually reducing." Reports from the Meteorological Station confirmed that the southern islands are in a drought season. Rain has not fallen, and if the drought continues, the situation will be critical. According to Dr. Iete Rouatu, Director of Statistics, this drought period could cause economic and social problems. "Copra cutters will lose their source of income," he said. "Islands and church development projects would be affected. Not only that, companies relying on copra would also be affected. The Kiribati Copra Society, which exports copra abroad, the Kiribati Copra Mill, which manufactures coconut by-products, the shipping companies, which provide transport and a lot more." Dr Rouatu said it’s an advantage to government because it will spend less money and subsidies, but the worst hit are the people on the outer islands, who rely on copra revenue as their main income….. Carbon Trading and the limits of free-market logic Carbon trading, its backers claim, brings emissions reductions and supports sustainable development in the global south. But, argues Kevin Smith, it may do neither, and is harming efforts to create a low-carbon economy. 04 OCTOBER 2007 HONIARA (Pacnews) ----- A pilot project in Solomon Islands aims to provide every child with a laptop and internet access.The ‘One Laptop Per Child’ initiative started in the United States with a plan to create a laptop computer costing less than $US100. The creation of three new wildlife management areas in Papua New Guinea will protect some of Asia-Pacific’s most threatened and unique wildlife habitats. The new Aramba, Tonda extension and Weriaver areas cover about 710,000 hectares in Papua New Guinea’s Western Province, and join up with the existing Tonda wildlife management area of 610,000 hectares. These areas, together with the adjoining Wasur National Park in Papua, mean that almost 2 million hectares of the TransFly Ecoregion will be protected. ‘The creation of these new protected areas means that the TransFly region will now contain the largest continuous protected area in the country,’ said Dr David Melick, WWF’s TransFly Ecoregion Coordinator. The TransFly is a vast, low-lying coastal region of grasslands, savannas wetlands and monsoon forest in south-central New Guinea. Home to such unique wildlife as marsupial cats, endemic flying possums and birds of paradise, the region covers more than 10 million hectares, straddling the borders of Papua New Guinea and Indonesia. ‘We hope that this region will soon be formally recognised as a cross-border conservation zone to enable international action on conservation and livelihood threats,’ Dr Melick added. Hundreds of local tribal groups from surrounding villages celebrated the announcement of the protected areas in a traditional ceremony. Local community leaders, politicians and wildlife officials took part in the ceremony, as well as world-renowned conservationist and author Professor Jared Diamond, and WWF representatives, including WWF International’s Executive Director of Conservation, Guillermo Castilleja. ‘We are working with local landowners so indigenous values can shape a biodiversity vision to protect priority landscapes on both sides of the political border,’ said Dr Melick. There are over 60 cultural groups, whose lives, customs, languages and knowledge are linked inextricably with the landscapes of the TransFly. It is also home to some of the largest wetlands in the Asia-Pacific region, but it is threatened by development and agricultural expansion. Millions of birds inhabit the floodplains, with over 50 per cent of New Guinea’s bird species found in the ecoregion, including 80 endemic species. The wildlife management areas will be managed by local landowner committees, with assistance from WWF to promote protection of wildlife and habitat, and sustainable enterprises such as eco-tourism. Farming throughout the world is underpinned by the vast genetic diversity of agricultural plants. This diversity provides the means for adapting the crops we grow to meet rapidly changing needs and demands. More than 6 million samples of different crops are currently maintained in collections in some 1500 genebanks around the world, representing humanity’s most important resource in the struggle to feed its ever expanding population under changing climates, shifting pests and diseases and increasing energy costs. Yet, in spite of its importance, much of this genetic storehouse remains untapped – a neglect that largely arises from the fact that much of it has yet to be adequately characterized and evaluated. We do not know enough about the collections we are conserving. A lack of readily available and accurate data on important traits can severely hamper plant breeders’ efforts to identify material they can use in their genetic improvement programmes. Recognizing this bottleneck to the use of collections, the Global Crop Diversity Trust is initiating a competitive grants scheme to support the evaluation of genetic resources. The Trust will provide approximately 20–25 grants annually, to enable breeders and others to screen germplasm collections for important characteristics and to make the information generated publicly available. Priority will be given to supporting the evaluation of collections identified in the relevant crop and regional strategies or other expert consultations as being of greatest importance within the total global genepool. Priority will also be given to screening for characters of greatest importance to the poor, and especially those that are important in the context of climate change.All interested parties are hereby invited to submit proposals for consideration by the Trust for an Award in 2008. Provided below are links to information on eligibility and application procedure and the template for the submission of proposals. Also provided is a link to the Trust’s terms and conditions for grants under this awards scheme. Our goal is to provide a flexible query tool to access information on Hawaiian vascular plants from a taxonomic or geographical perspective at a variety of levels of detail. Queries can result in a simple checklist with island distribution to information on names, types, identifying characteristics, and images (illustrations and photographs). Currently, the available databases can supply checklists of Hawaiian flora and type information for names based on Hawaiian collections. The present checklist database consists of 151 families, 777 genera, and 2,325 taxa of flowering plants and 27 families, 72 genera, and 214 taxa of ferns and related groups. Work is still underway to verify type collection records and publication information for all scientific names. Currently information is available for each name, some records are verified and others are not. The site will also be enhanced by adding specimen information from collections in the United States National Herbarium, synonyms for naturalized plants, images for all species, descriptions, and a bibliography of publications on Hawaiian plants. Our long-term goal is to expand the scope of our flora project and eventually provide the Internet community with the most complete reference on the flora of oceanic islands of the Pacific Basin. Look for additions to include Micronesia in the near future. The United Nations Food and Agriculture Organization (FAO) today launched a new interactive web-based site (http://www.e-agriculture.org/,) underscoring the important role information and communication technology (ICT) can play in promoting agriculture and rural development. Users can exchange experiences, opinions and good practices on the platform, www.e-agriculture.org, which was developed by the FAO and its partners. The platform is part of the Community of Expertise - a global initiative to boost sustainable agricultural development and food security through increased use of ICT –that includes policymakers, rural service providers, development practitioners, farmers, researchers and ICT specialists. "We are confident that the e-agriculture Community of Expertise will help facilitate further global discussions and decisions facing farmers, Governments and the international community at large related to the role that ICT can have in agriculture and rural development," said the Director of FAO's Knowledge Exchange and Capacity Building Division, Anton Mangstl. More than 3,400 people from 135 countries participated in an online survey and in virtual forums to help develop the platform. Although the digital divide is shrinking, only 18 per cent of the global population has access to the Internet. The UN International Telecommunication Union (ITU) estimates that one billion people worldwide - most of whom depend in some way on agriculture for their livelihoods - still lack connection of any kind to ICT. The Tongan squash industry is fighting for its survival after more than 80 percent of growers withdrew from planting the vegetable. The kingdom started growing squash in 1988 and it has become one of its major exports to mainly Japan and South Korea. But the Squash Council’s secretary, Stephen Edwards, says increased costs of imported seeds and fertilisers, higher freights rates and low prices for the crop on the world market have scared many growers away. Mr Edwards says as a result Tonga will export less than half of last year’s harvest. Stephen Edwards hopes the small tonnage will fetch a better price which he says will determine the industry’s survival. 28 SEPTEMBER 2007 NEW YORK (Pacnews) -----Representatives of four Pacific nations today used their addresses to the General Assembly to warn the world’s affluent countries to make sure they do not shirk their responsibilities in the global fight against climate change. Speakers from Papua New Guinea, the Federated States of Micronesia, Nauru and Palau told the Assembly’s annual high-level debate that their landscapes – with long coastlines exposed to rising sea levels – leave them in the front line of the global warming battle. Papua New Guinea Prime Minister Sir Michael Somare said “we are very concerned to see certain industrialized nations attempting to avoid responsibility for their own carbon emissions and shifting the focus to developing nations. Sir Michael outlined a series of measures he said must be in place in the successor agreement to the Kyoto Protocol on greenhouse gas emissions, which is due to expire in 2012. Small island developing States such as Micronesia have a pressing need for greater access to renewable sources of energy so they can move away from a dependence on fossil fuels, Mr Mori said. Nauru President Ludwig Scotty said it was unfair that small island developing States were among the most vulnerable to the effects of climate change when they collectively contributed so little to the emission of greenhouse gases. Pages of many web site contains global warming pictures. But that pictures not give enough information of global warming. Global Warming myth is very deep ozone has doubled since the mid-19th century due to chemical emissions from vehicles, industrial processes and the burning of forests, the British climate researchers wrote. Rural students and rural teachers have far lower ICT access that urban students and teachers, the survey showed, putting rural Pacific Islanders at a social and economic disadvantage. The Pacific eLearning Observatory at the University of the South Pacific surveyed 60 ICT and education experts – including members of the Pacific Internet Society, PICISOC - across the region to assess their opinions on ICT in education, its current status in the Pacific, the perceived challenges to development, and recent developments. The survey showed that training and capacity building, curriculum development, infrastructure, policy planning and top-down government support are perceived as the most important factors in ICT development. Current initiatives in the region range from early-stage policy formulation and the construction of ‘ICT centres’ for rural communities, to the construction of databases and online portals to support educational administration and the delivery of learning materials. “This timely survey highlights the need for greater emphasis on ICT in education by Governments in the region, and the need to nurture and support initiatives which will help alleviate some of the issues highlighted,” said Rajnesh D. Singh, Chairman of the Pacific Islands Chapter of the Internet Society(PICIS). “There is also a need to develop and introduce curriculum suitable to today and the future as early as possible, ideally at the primary school level”. Monitoring ICT development is important to USP because 42 percent of its 22,000 students are distance-based learners, and access to ICT impacts directly on the design of learning delivery modes. USP provides extensive ICT access to students via USPNet, and conducts long-term planning to help provide students with a better service.